Anti-inflammatory, anti-arthritis, anti-ulcer, anti-pyretic, diuretic, and blood glucose-lowering benefits. 1. 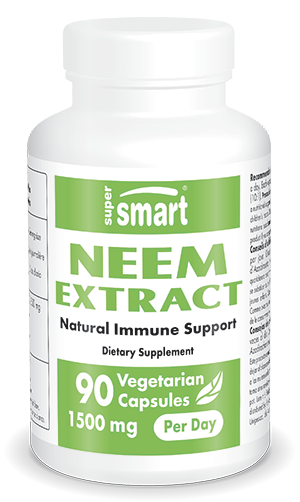 Neem supplement, which purifies the blood' and detoxifies the body, is good for maintaining healthy skin, and in particular, for treating eczema, athlete's foot, candida and acne. 2. It has antibacterial activity against staphylococcus aureus, a common source of food poisoning and urinary infections, and salmonella. A 0.2% concentration of Neem had the same anti-bacterial effect as penicillin G.
3. It has an antiviral effect on smallpox, hepatitis B and herpes. 4. Its antiseptic qualities help to prevent periodontal diseases (it is a common ingredient in toothpaste). 5. It has anti-inflammatory activity comparable to that of aspirin (by inhibiting prostaglandins). 6. It exerts immuno-modulatory activity on Th-1 lymphocytes and is considered a potent stimulant of the immune system. 7. It has a powerful hypoglycaemic effect, beneficial both to those suffering from Type I diabetes (insulin-dependent) and Type II (known as fat diabetes), through as yet unidentified mechanisms. 8. Studies on guinea pigs and rabbits show it has a significant and dose-dependent hypotensive effect. Each vegetarian capsule contains 500 mg of Azadirachta indica (10:1). Take one vegetarian capsule three times a day or as suggested by your therapist.